Getting a job is no easy challenge. It takes a lot to impress employers in the modern job market because there are always so many competing candidates. The key to making a good impression is your resume. This is your best tool for catching readers’ attention, standing out from the crowd, and improving your employment chances. It is not easy to create an effective resume. Employers have specific expectations that you need to meet. By reviewing free acting resume templates, you can learn all about what you should put in your resume to make it as strong as it possibly can be. Why Use Free Acting Resume Templates? Resume templates make it much easier to get started on your resume, especially if you are not sure where to begin. They demonstrate what good aspects to include and warn against the ineffective writing practices. There are few documents more important than your resume when it comes to finding employment, so you need to be confident that what you write will get the job done. If there is one aspect more important for actors than any other, it is creativity. You should express this aspect on your resume as well. Of course, you have to be careful about how you format your document and what content you include. Still, if you follow the example of a creative resume template, you can make a highly effective resume. All resumes should be professional, but some positions may require you to put more effort into fulfilling this requirement. Professional free acting resume templates demonstrate exactly how you can make your resume emphasize your professional qualifications in the most effective way possible. Take a thorough look before you begin the writing process for the first time. basic and simple free acting resume templates. One common rule for resumes is that they should be brief. It is generally recommended that yours be no longer than one page. You should only use two pages if you are trying to capture 10 year of working experience or more. 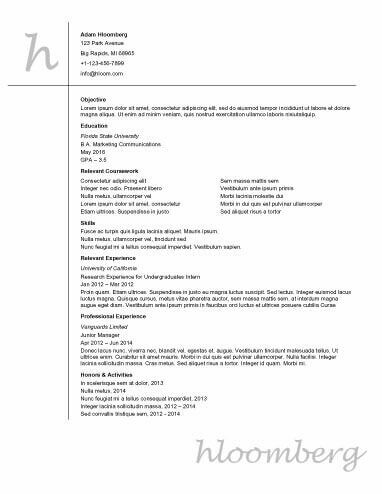 Consult a one-page resume template to learn more about the resume length requirements and how to best format a one-page resume. Your resume will be very different depending on whether you have worked before or not. Entry-level resumes have some unique features. They focus more on education because there is less work experience to describe. Our entry-level free acting resume templates can help you understand the best way to appeal to employers when you are just starting your career. A big part of making a strong resume is knowing what content to include. Of course, it is important that you use language related to the acting field, but your resume should also include the right sections. The following guide and free acting resume templates will help you understand how to format your resume and what to say. Begin your resume with your contact information. It should be subtle and brief so it does not draw attention away from other sections. Include your full name, email, address, and phone number. Make sure your email address is respectable and professional. A casual or inappropriate address can hurt your chances. Write a short paragraph that hooks the attention of readers and encourages them to continue reading. Your summary should include information from the rest of your resume, such as your working experience and skills. Do not include an objective statement in this section except under special circumstances. This was once expected, but it is now outdated unless you are changing careers, starting your first job, or returning to the workforce after a long period of time. If you include one, keep it short and sweet. The skills should take the form of a short bulleted list. Write up four to eight bullet points, with each detailing a different skill. Only include skills that relate directly to the position you are applying for. Skills can be a single word or a short phrase, for example, "Strong oral communicator." As the most important section, your work experience information should be dense and strong. List your previous positions in reverse order. Your current work can be in present tense, while older jobs should use the past tense. Try to include five to eight bullet points for each job, although you can have fewer or more depending on how important the job is. Always have a strong action verb for the first word of every bullet point. The verb you choose should reflect the responsibilities you had. The education section should be incredibly brief. The only pieces of information you must include are your school, date of graduation, and type of degree. Do not mention your GPA unless employers ask for it specifically. It is a good idea to list internships, awards, or recognitions in this section.